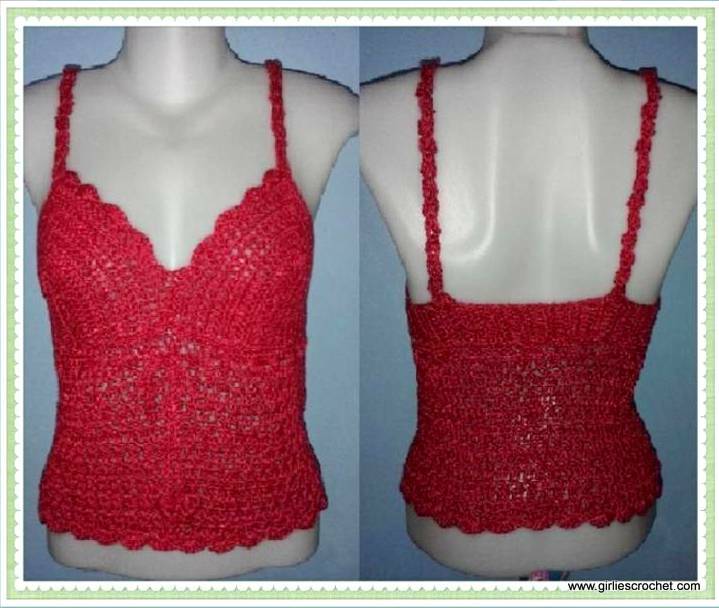 This is a free crochet pattern for crochet top called Red Summer Top. This top fits between size 32 and size 34. 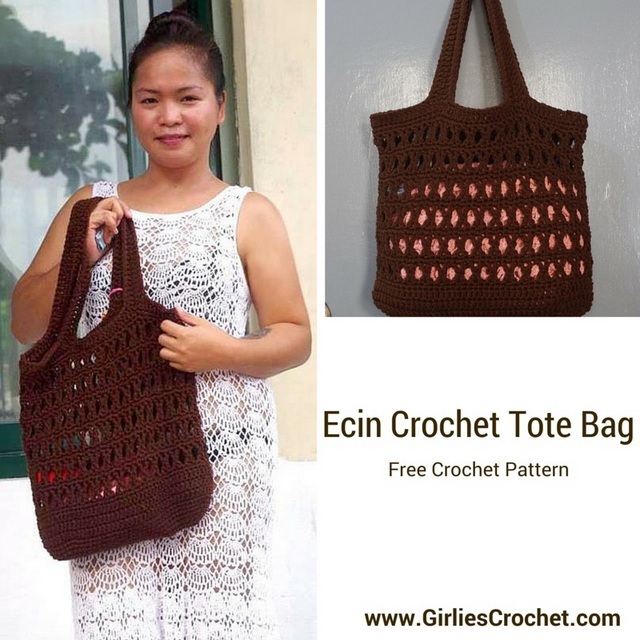 I used wildflower stitch in this pattern, please view the video and continue the pattern. CH 127 or about 28 inches, Slip stitch to join, be careful not to twist your work and HDC around slip stitch to join. Round 1: CH 1, YO your hook, insert in the next stitch, YO, don't pull through ( you have 3 loops on your hook) insert your hook in next stitch, YO, don't pull through ( you have 4 loops on your hook) insert your hook in next stitch, YO, now you have 5 loops on your hook, YO, pull through all of the 5 loops, * CH 1, YO, insert you hook on the same stitch of your last loop, YO, don't pull through ( you have 3 loops on your hook) insert your hook in next stitch, YO, don't pull through ( you have 4 loops on your hook) insert your hook in next stitch, YO, now you have 5 loops on your hook, YO, pull through all of the 5 loops, * repeat til you reach the last stitch, if you have extra stitches just add another loop on your hook before chaining 1 and slip stitch on the first CH 1. The 5 sc cluster is the half of the flower. Round 2: CH 1, 2HDC on the center of the 1st cluster, * skip the next stitch and 2HDC * repeat to the last flower, slip stitch to join CH1 and repeat Round 1 & 2 until you reach desired length of your top, mine I made 9 rows of the flower plus a row of DC, this is where to put the ribbon. Attach the yarn on the bottom part of the top,* SC skip 1 stitch 5 DC on the next skip 1 stitch * repeat and slip stitch to join. CH 15+2 DC on the 4th CH from the hook count as 1st DC, DC in each of the following 13 CH, (14 DC in total) then 5 DC on the 15th or last CH, DC on the remaining 14 spaces. (19DC in total including the CH3) CH 3, turn. Round 1: DC in each of the next 14 ST, (total of 15 DC) 2DC in each of the 3 ST (16,117,8) DC in each of the reamaining 15 ST, (36 DC) CH3, turn. Round 2: DC on the next 15 ST, total of 16DC including chain 3, 2DC on the 17, 1DC on 18th, 2DC on The 19th, 1DC on 20TH, 2DC in 21ST, & DC in each of the remaining 15 ST,( 39DC) CH3, turn. Round 3: DC in each of the next 18 ST, 4 DC on the 19st and DC in each of the remaining 19 ST (42 DC) CH 3, turn. Round 4: DC in each of the next 19 stitches, 2 DC on the next 2 ST and DC in each of the remaining 20 SP. (44 DC) CH 3, turn. Round 13: DC on the next 9 ST (10 DC) FO & make the 2nd cup. Round 39: SC around the bottom of the bra. On the 1st stitch beside the strap attach the yarn either you make a tie to secure it or do as you please, make an SC *skip next stitch 5DC on the next, skip next stitch SC on the next* repeat to make 4 shells. Skip 1 stitch 2DC on the next, 2DC on the 1st stitch of the other cup and make 4 more shells. 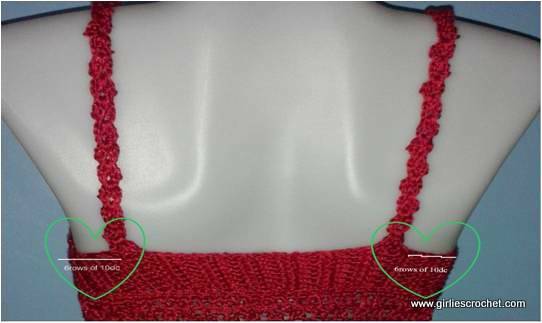 Repeat till you have 20 open shell stitches or up to the desired length of the strap and attach it to the back about 6 rows of 10 DC's. Remember you added 24 more rows of 10 DC, count 6 from both side. 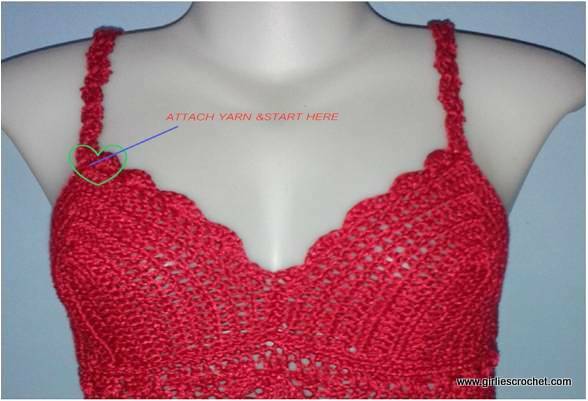 * If the strap is too long or short you can add or remove some open shell/rows. CH 4 slip stitch to join, * HDC, DC HDC, SL ST on the ring * repeat to have a total of 5 petals Chain 230 or about 50 inches or up to desired length of your ribbon and 4 more chains SL ST to the 5th chain from the hook to form a ring, * HDC, DC, HDC, SL ST on the ring * repeat to have a total of 5 petals SL ST, FO and leave tail to weave in.